HispanicNashville.com: West Wing DVD, VeggieTales, and Schermerhorn documentary show how values make immigrants "impressive"
West Wing DVD, VeggieTales, and Schermerhorn documentary show how values make immigrants "impressive"
"Naval Intelligence reports approximately 1200 Cubans left Havana this morning. Approximately 700 turned back due to severe weather, some 350 are missing and presumed dead, 137 have been taken into custody in Miami and are seeking asylum." "With the clothes on their backs, they came through a storm. And the ones that didn't die want a better life. And they want it here. Talk about impressive." What do all three have in common? They reflect values that, if applied to the immigration debate, would put this country in a much better position to implement the mandate to love our neighbors. The West Wing quote above is self-explanatory, and VeggieTales episodes are ripe with lessons about loving your neighbor, but how does the Schermerhorn Symphony Center documentary fit in? Because at a time when some (circularly and unbiblically) think that law and order itself should be the primary value of U.S. immigration law, our city graciously chuckles at the fact that - according to the documentary - our beloved former symphony conductor pined for music so much that, "[a]t age 14, Kenneth Schermerhorn forged a baptismal certificate so he could join a jazz band that played in nightclubs." We love the man, so mentioning the transgression is not an indictment but an indication of how passionate - how impressive - he was at that early age. Maybe if we considered every last immigrant to be as impressive, the history of how they joined our national fellowship would be a testament to their tenacity rather than a potential source of condemnation. 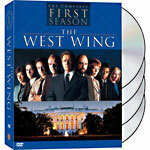 As I said to the friend who lent me the West Wing DVD, it may just boil down to who you consider your friends. If you are friends with someone, you appreciate them and you want to do anything you can to help them. If not, you're either indifferent, or you actively oppose them. In the case of immigration, opposing immigrants can take the form of allowing laws to stay in place even though they act as bear traps to our very own neighbors. My church just sent an e-mail asking for prayer for a couple of our missionaries who were detained at the U.S./Mexico border heading north and not allowed back in. Those missionaries are our friends, so we will pray and plead for the government to allow them to be with us. What a miracle it would be if there were e-mails going out from every church about all the immigrants our laws don't allow in, or all the immigrants who are in but not allowed. I think plenty of Nashvillians and Americans see immigrants through the eyes of friendship and of love, and who want our laws to have those values. Maybe it's because we see the immigrants as friends. Maybe it's because of the commandment, second only to loving God, that we love our neighbor. Maybe it's because when we invite the stranger in, we get a chance to meet Jesus (Matthew 25:37-40), or an angel (Hebrews 13:2). After he showed me a papal message reminding Catholics that Jesus, Mary, and Joseph were an immigrant family, I joked to a law partner of mine that Jesus' second coming would most likely involve an act of illegal immigration if he touches earthly soil, assuming he arrives from the clouds and doesn't land at a border crossing and have the foresight to bring a visa. Maybe it's not much of a joke - if Jesus is in the face of every immigrant, we have already excluded him and are in grave trouble. As potential messengers from God or even the Son of God himself, immigrants can be nothing less than impressive, especially in the Bible Belt. The question we have to ask ourselves is, how do we fare when we stand next to these impressive people? With American immigration bureaucracy as it is, we don't even offer a legal method of entering or staying in this country for people who don't fit into narrow and numerically capped categories of connections to employment, family, or oppression back home. If we had federal, state, and even local laws to take Jesus seriously, to give the immigrant a real and simple chance to say "friend" when asked, "friend or foe," and then to welcome that immigrant with open arms - now that would make us impressive.